I recently had a chance to sit down with InvestFourMore real estate, investor, and entrepreneur expert Mark Ferguson to discuss how we both catapulted our individual results. We also take a deep dive into how I left my corporate job. If I say so myself, we have great chemistry in this fast-paced podcast. 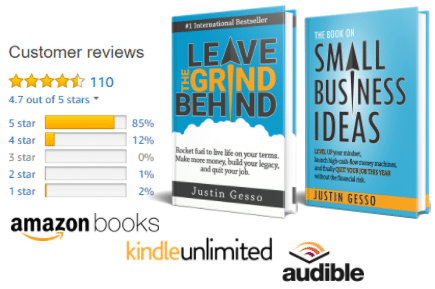 The podcast came right on the heels of the release of my book, Leave the Grind Behind, which has since gone on to become a #1 best seller! You can find the transcript at InvestFourMore here. Mark and I went to college together, and later crossed paths when we were both in early stages of doing something big in our lives. While Mark grew up in real estate, he didn’t want to go down that path. However, after college, he realized the value of being in charge of making your own money, which is something he could do through real estate. His success was far from immediate, and didn’t come until he started applying the principles you’ll find in the book and our discussion. On the other hand, I took the “standard path” that nearly all of us are groomed for through upbringing and schooling: go to school, get a job, work hard. That path may be good for most people, but it wasn’t for me! If you’re not in charge of your own money, time, and goals, someone else is. Working purely to achieve someone else’s goals would not allow me to generate the sort of wealth, happiness, and time I need to ensure I got the most out of my life. I thought I was doing very well in my 6-figure corporate job, but he was making multiples more than me and most anyone I knew! Mark didn’t even realize how much better off he was until we started really talking about what is too often a taboo topic…personal money. What I had was the ability to get incremental raises and occasional bonuses. What he had was the ability to multiply his money and see results that could scale. Is it having a corporate job secure? Or risky? While I always thought having a corporate job was the secure option, and that having your own business was risky, this quickly unraveled for me. It’s hard to shake the conditioning that says you need a steady job, benefits, and a 401K. But in taking this, there is tremendous opportunity cost…especially if you are motivated. I was trading huge amounts of my time (most of my waking life!) to achieve someone else’s goals. This is no way to be. I was a Cog and quickly realizing what I was giving away in the process. Sure, there are risks to quitting your job and chasing your own avenues to make money, but with the right mitigation strategies in place, that risk can be massively reduced. Mark and I dive into this risk reduction in the podcast, and it’s a cornerstone of Leave the Grind Behind . Using Mark as motivation and as a key partner, I was able to start a huge chain of events. Ultimately I achieved my goals…though now I have much bigger ones. I am earning money in a scalable manner. I’m in charge of my time, money, results, and goals. I have been able to repeat this process numerous times now, launching and building multiple winning strategies. I documented all of this as I went through the process and then refined afterward in my book, Leave the Grind Behind. Do you have what it takes to quit your job? If you have big goals, want to leave a legacy, want to make more money, be in charge of your time, enjoy freedom, and have multiple income streams…you owe it to yourself to get more! I won’t lie, you need to work hard and plan well, but with the right approach, if you set your mind to it, you can live a life you direct. A life you’re in charge of. 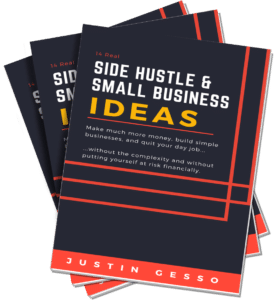 You can get the book right here on Amazon: Leave the Grind Behind .